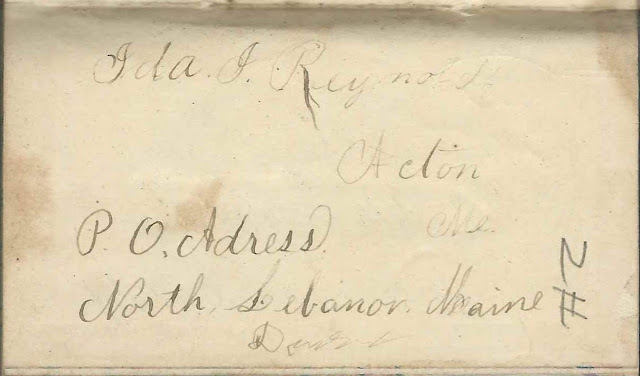 August entries in the 1873 diary of Ida Isadore Reynolds (1860-1946) of Acton, Maine. Ida would marry John Jotham Shapleigh (1856-1923) in 1881. 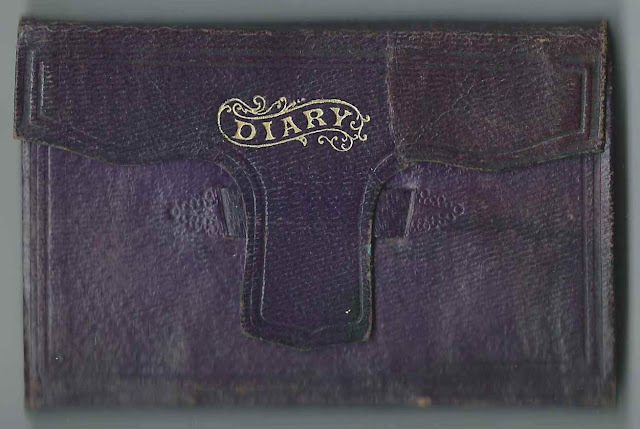 Links to the months of July 1873 and September 1873 appear here and at the end of this post. Saturday, August 2, 1873: Fair. Baked. Went to Clara's. 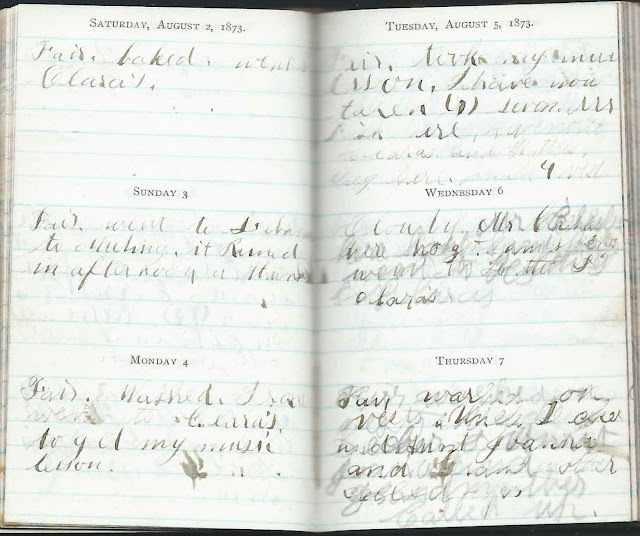 Monday, August 4, 1873: Fair. Washed, Ironed. Went to Clara's to get my music lesson. 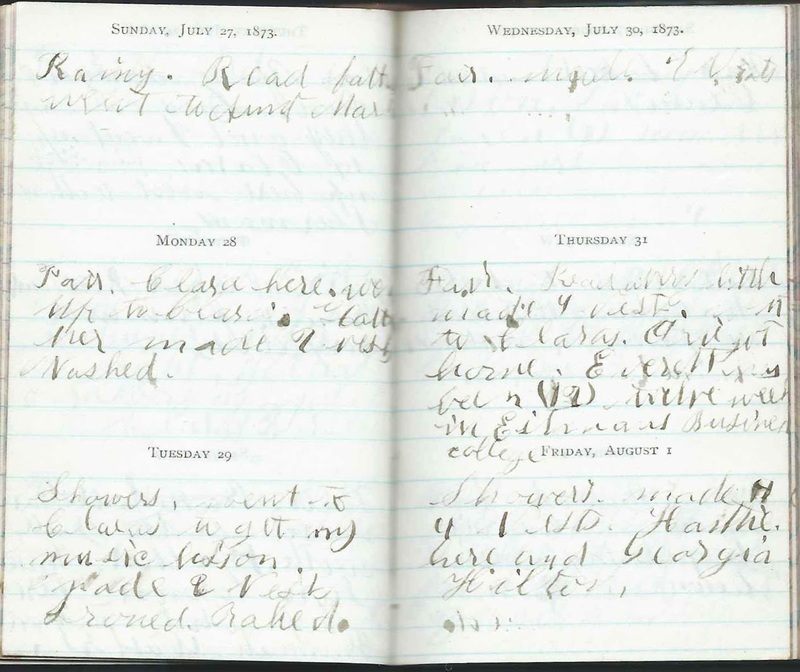 Tuesday, August 5, 1873: Fair. Took my music lesson. I have now taken (7). Mr. Fisk here. Went to Clara's and Hattie's. They here. Made 4 vests. Wednesday, August 6, 1873: Cloudy. Mr. ____ here. ____ went to Hattie's and Clara's. 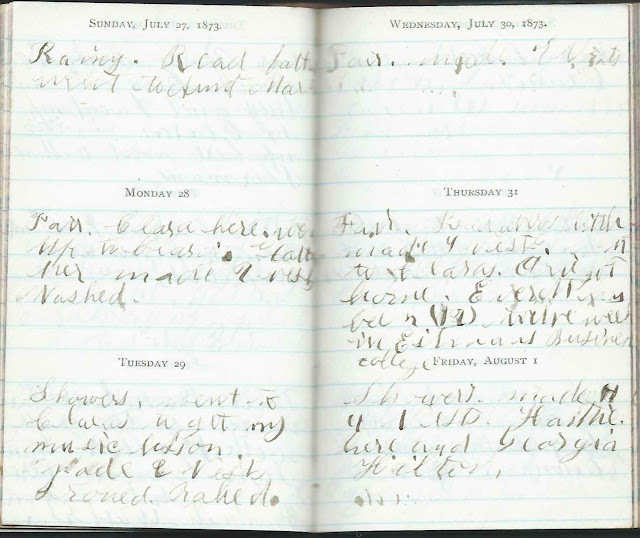 Thursday, August 7, 1873: Fair. Worked on vests. Uncle Decker and Aunt Joanna and Grandmother called up. 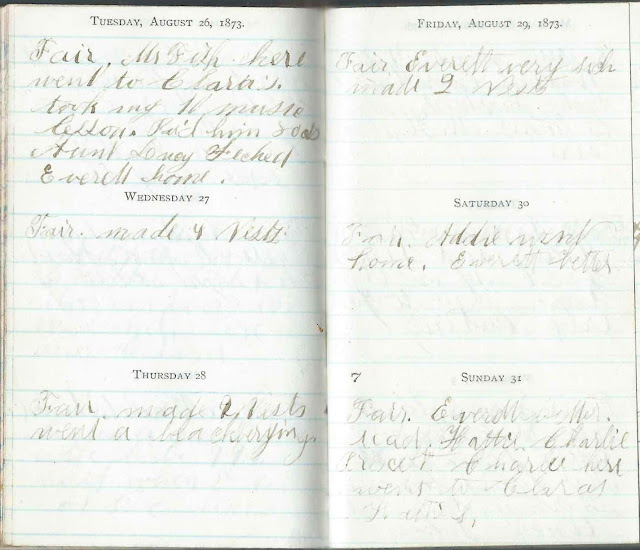 Friday, August 8, 1873: Fair. Mr. Wilks [Weeks] here; took 36 vests. Sunday, August 10, 1873: Fair. Read. 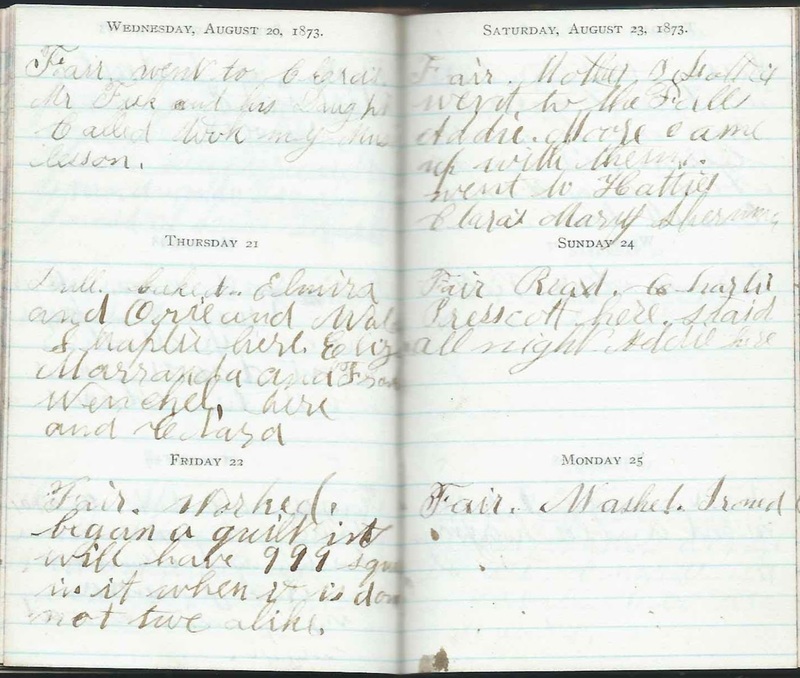 Wednesday, August 13, 1873: Cloudy. Uncle Decker and Aunt Joanna and Aunt Martha and Uncle Jacob up. Clara was here. Made 9 Vests. Friday, August 15, 1873: Fair. Went to Clara. Made 4 vests. 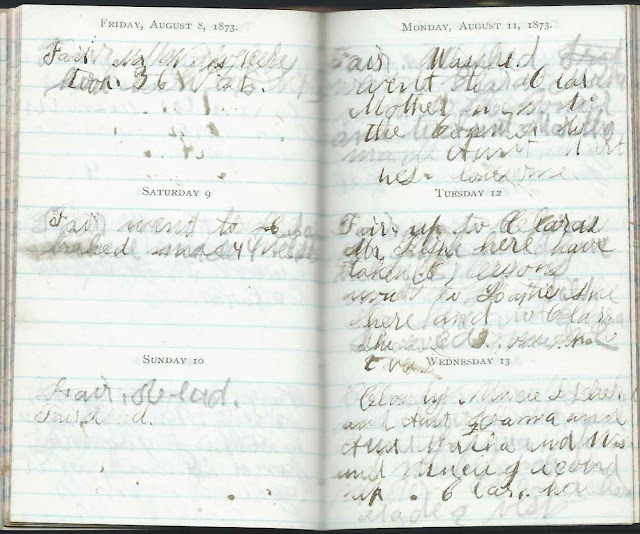 Saturday, August 16, 1873: Fair. Uncle Decker and Uncle Jacob and Walter up. Went to Aunt Martha's. 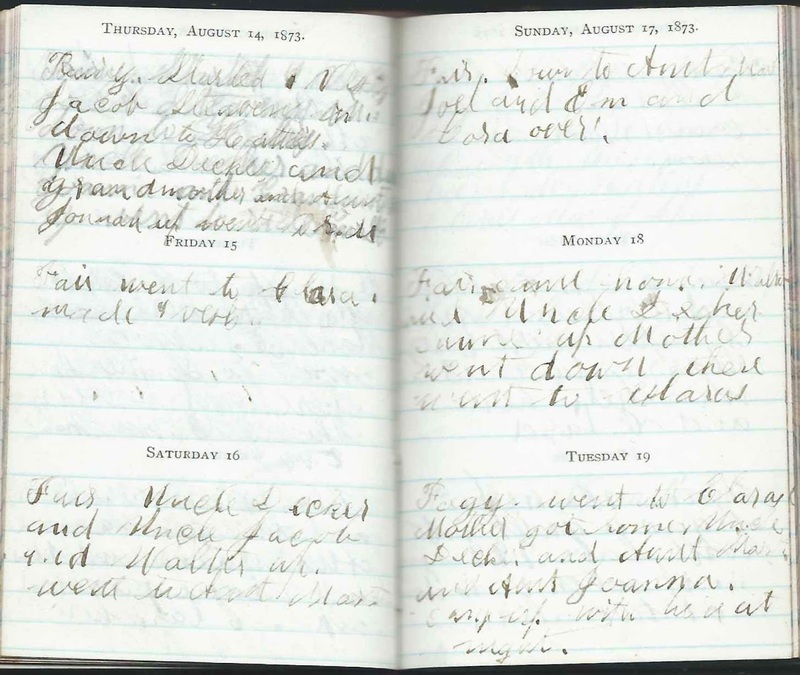 Monday, August 18, 1873: Fair and ___. Walter and Uncle Decker came up. Mother went down there. Went to Clara's. Tuesday, August 19, 1873: Foggy. Went to Clara's. Mother got home. Uncle Decker and Aunt Martha and Aunt Joanna came up with her at night. Wednesday, August 20, 1873: Fair. Went to Clara's. Mr. Fisk and his Daughter Called. Took my Music Lesson. Thursday, August 21, 1873: Dull. Baked. Elmira and Orie and Wal Shaplie here. Eliza, Marranda and Frank Wenchel here and Clara. Friday, August 22, 1873: Fair. Worked. Began a quilt. It will have 999 squares in it when it is done. No two alike. Sunday, August 24, 1873: Fair. Read. Charlie Prescott here. Stayed all night. Addie here. Monday, August 25, 1873: Fair. Washed. Ironed. Tuesday, August 26, 1873: Fair. Mr. Fisk here; went to Clara's. Took my 10 music lesson. Paid hinm 80 cts. Aunt Lucy ___. Everett home. Wednesday, August 27, 1873: Fair. Made 4 Vests. Thursday, August 28, 1873: Fair. Made 2 Vests. Went a-blackberrying. Friday, August 29, 1873: Fair. Everett very sick. Made 2 vests. Saturday, August 30, 1873: Fair. Addie went home. Everett better. Sunday, August 31, 1873: Fair. Everett better. Read. Hattie, Charlie Prescott, Charlie here. Went to Clara's, Hattie's. Jacob Stevens - Jacob Brackett Stevens (1850-1917), son of Hubbard Stevens (1805-1882) and Harriet C. (Brackett) Stevens (1808-1883) and husband of Charlotte M. (Shapleigh) Stevens (1851-1917), "Lottie"
Elmira and Orie and Wal Shaplie - Elmira Sophia (Prescott) Shapleigh (1846-1911), "Myra", and husband Oliver Waldon Shapleigh (1844-1879). Orie was either Myra's sister Orianna Maria Prescott (1848-1832), wife of Nicholas Blaisdell Shapleigh (1842-1924), or brother Oren Burbank Cheney Prescott (1850-1925), although he was normally known as "Cheney"
Advance to September 1873 or return to July 1873.